The featureless expanse of an empty stage is a plain of possibilities; a creative vacuum into which a dramatic vision can rush and expand. 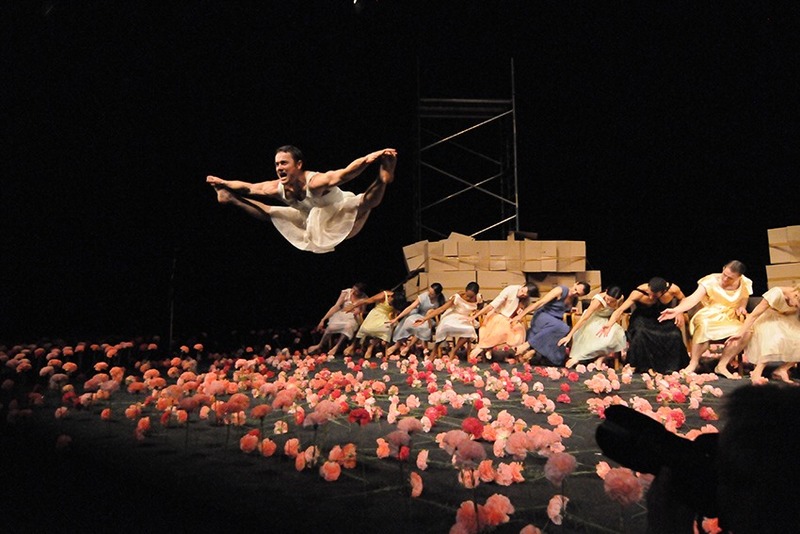 But capturing a unique world in the theatre is a delicate and often fickle art, and few have ever mastered the alchemy of conjuring a viscerally charged performance space as expertly as the late, great Pina Bausch. For her, the proscenium arch was a womb. In this fertile space, creativity didn't merely happen, it gestated. Given the organic qualities of her process, it’s little wonder that throughout her canon of choreography we find extraordinary universes rooted in the natural. Whether it be the watery veil of Vollmond, the great, verdant monolith of plants that slowly cascades like an ocean wave from Weisenland, or the earthy, primordial abyss of Bausch’s superlative setting of Stravinsky’s Le Sacre du Printemps, rarely has the theatre been used so transcendently. Arguably one of Bausch’s most effortlessly arresting scenes is the simple yet breathtaking blanket of pink carnations found in her 1982 tanztheater masterpiece, Nelken. And yet, despite its gentle appearance, this work’s psychological terrain is amongst the most disturbing explored by this visionary dance maker. Bausch’s genius was not in the nuances of her movement or the cleverness of her plots. Her muse was emotion, and the questions that drive our most universally shared impulses: our need for love, our innate curiosity, our pursuit of joy and happiness, and our right for compassion. Her searching, open-hearted willingness to explore the full spectrum of the human experience is unquestionably the reason that her work communicates across the boundaries of nationality, language and culture. These basic human instincts fuel the often whimsical trajectory of her productions, but in Nelken, it is the subversive antithesis of these desires that power the dramatic momentum. Much of the imagery offered in this piece is knowingly double-edge. The beautiful meadow of uniformly tall, perfectly arranged blooms is patrolled around its borders by suited guards with attack dogs. A man, with the cute, persuasive tricks used to feed a baby, force-feeds a woman oranges. A collection of men, wearing ill-fitting party dresses, lollop around the field like naughty puppies in a display that is both silly and yet humiliating. The very act of performing this work offers the most poignant contradiction of all, as the perfect, unblemished sea of blooms is trampled and irretrievably destroyed by the dancers who scuttle and leap about the stage. Nelken’s sequence of surreal, eccentric episodes are narratively ambiguous, but there is also a subtle, almost inscrutable essence of the auto-biographical present. As a German child of World War II, Bausch has seemingly used Nelken to exorcise some of the horrific demons that inevitably lingered over her generation. Throughout, there is an examination of oppression and the control asserted by the state over the individual: an ominous man in a tuxedo, with a thin, sinister smile, repeatedly demands to see the performers’ passports. Some are allowed to continue, while others are made to enact degrading rituals, such as stripping or imitating animals. But of course, Bausch has focused this study of the tyrannical through many lenses, and these more confronting moments are counterpointed with acts of pure élan that suggest a more childlike relationship to authority. Riotous playground games, funny little rhymes and a cunning dance move for eliciting hugs provide the light required to truly understand this piece’s many shadows. Sometimes the paradox of comedy and abuse are superimposed, such as when a furiously cranky dancer shows off his fading skills in a bittersweet ballet of desperation. Bausch’s ability to balance the scales of agony and ecstasy is a reminder of her enduring accomplishments, and yet there is a freshness to this performance which speaks to a change in this company. I first saw this piece a decade ago in London, and in 2005, some four years before Bausch’s death, Tanztheater Wuppertal still contained many of the same performers who worked with her on this piece’s creation in the early 1980s. The number of original cast members is very much smaller now, and while Nelken has lost none of its dramatic potency, there is a tangibly altered energy to this company’s delivery of this work. Many of the younger dancers on stage will never have worked directly with Bausch and so the passion and commitment of this performance comes from a place of reverence rather than personal experience. Following her sudden death in 2009, just five days after being diagnosed with lung cancer, the artistic imperative of this ensemble of collaborators was abruptly derailed. Devastated and bereaved, the members of Tanztheater Wuppertal have spent the past six years memorialising their lost leader through her astonishing dance, unwilling to let go of Bausch’s guiding influence. But since last year, they have begun making new work again, finally allowing the next chapter in this company’s life, post-Bausch, to start in earnest. With this in mind, one scene in particular from Nelken has a touching resonance. After its darker scenes, this piece offers us an uplifting parting gift: each performer enters and reveals the reason they became a dancer. In addition to the beautiful and intriguing reasons offered, there is surely one more, unspoken yet shared by all on stage: the reason they dance is for Pina. First published 11 Mar 2016, for Limelight Magazine.